MAXDALE – Every area has its share of folklore, urban legends and ghost stories. In Central Texas, those stories focus on a haunted bridge, a witch’s grave and a limping ghost caretaker figure. My husband and I and Sentinel Leisure Editor Rachel Parks went to check out some local ghost stories last Friday. We started in Maxdale, a community about 10 miles southwest of Killeen. It has been said if you park on the old steel bridge at Maxdale and turn off your headlights, count to ten and turn them back on, you will see a man hanging from the steel beams of the bridge. As the story goes, the man hanged himself when he could not save his girlfriend from drowning in the river below the bridge. Today, the bridge is blocked by steel barriers to prevent vehicular traffic but can still be accessed by foot. We parked near the barrier and walked to the bridge and saw … an old bridge and trash left by previous visitors. An old stone marker about the bridge is covered in spray-painted graffiti as is the road leading to the bridge. Seeing the words KILLEEN in blue spray paint on the road really takes away a lot of the fright potential. After standing on the bridge for a few minutes, we walked back toward the car and grabbed flashlights. Our next stop was across Maxdale Road at the cemetery where legend states that a ghostly elderly caretaker with a limp has been seen wandering the grounds. 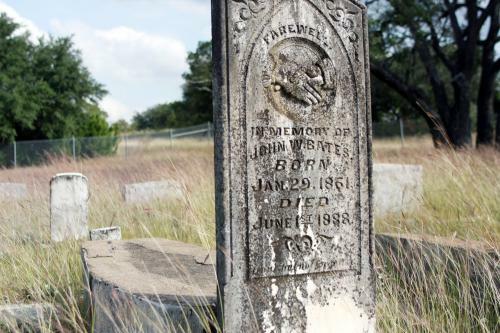 Maxdale Cemetery is one of the oldest in Bell County, with burials from the 1860s. It was established to serve the community of Pleasant Grove and is the final resting place of veterans of World War I, World War II and Korea as well as pioneer settlers. A fence prevents vehicular traffic, but there is a walkway for pedestrians to enter the grounds. We entered the graveyard and wandered around for about 45 minutes. The caretaker never appeared so we read the stones and meandered around the graves. The cemetery is well-maintained and in use today. The graveyard also holds a covered pavilion that unfortunately has a pentagram burned into its concrete floor. The pentagram, the spray paint and trash strewn near the bridge were all disappointing and upsetting to see. Chasing ghost stories and legends is fine, but be respectful. We took several photographs at the cemetery and the bridge, but found nothing even close to paranormal, so we set off to find Bittick Cemetery, the final resting place of a purported witch. Bittick Cemetery is located near Liberty Hill, a community just north of Austin off Highway 183. The graveyard lies on a country road and is clearly marked with no trespassing signs and others warning the curious to stay out. Given the dark out-of-the-way location, overgrown weeds and the eerie environment, I elected to obey the signs. Rachel and David are braver than I and entered the cemetery. The graveyard is spooky and holds the earthly remains of 13 people. The most recent burial was Lola King in 2000. The earliest was Elizabeth Spencer in 1861. We were there looking for one marker, that for Elizbeth Simpson. Simpson, who died in 1862, was, depending on the story you choose to believe, a purported witch or horse-stealing slave who was hanged from an oak tree across the street from the graveyard. For reasons I have not discovered, her grave has taken on a life of its own through legend. It is said that visitors to her gravesite must leave an offering or a terrible fate will befall them. While I am certain Simpson was neither a witch nor a horse thief, I gave Rachel a quarter to leave on the stone. Better safe than sorry. After Maxdale and Bittick, we made our way back to Killeen. On the road, we talked about how Fort Hood is not immune to ghostly and paranormal stories. There are tales about ghostly noises and footsteps in the III Corps Headquarters and a haunted housing unit on post. The development of ghost tales is not unusual given the post’s long and storied history. Long before this was Fort Hood, the land here was home to Native American Indian tribes and pioneer homesteaders. Those tribes and homesteaders died over the years and their bodies were interred in sites on what is now Fort Hood. Now, the post is home to more than 60 cemeteries and family burial yards. Most are fenced off but can be accessed. They stand as an interesting testament to the history of this land, and, especially around Halloween, places to reference to frighten friends.